When researchers from Penn Arts and Sciences step outside of their lab spaces, off campus and onto the streets of West Philadelphia, they enter a different kind of laboratory, a city with centuries of history, a complicated industrial legacy, and a demographic that’s changing all the time. 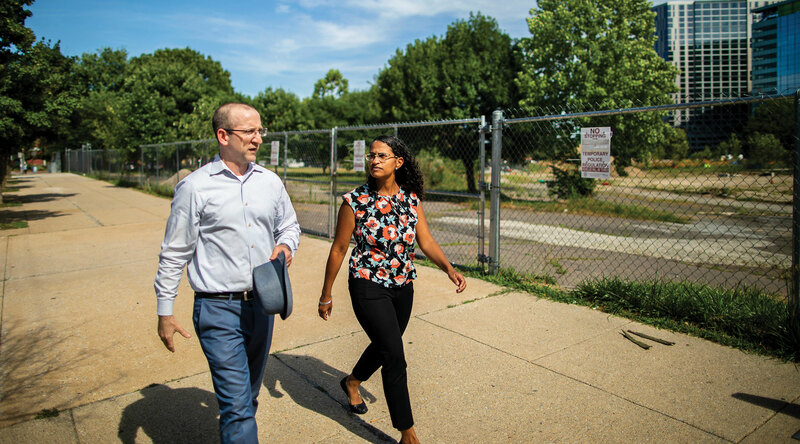 Researchers across the School are asking important questions, studying lead contamination and abandoned lots, the city’s education system, and its immigrant populations. The philosophy of first-graders tends to center around what’s happening on the playground or with their favorite superhero rather than around Philosophy with a capital P. But Karen Detlefsen, Professor of Philosophy, would like that to change, and she’s taking steps to make that happen by bringing the discipline into Philadelphia’s elementary and secondary school classrooms, from kindergarten all the way through grade 12. Funded by the latest round of Making a Difference in Diverse Communities grants from Penn Arts and Sciences, the project is in its early days. But Detlefsen has already built the scaffolding. Together with a team of undergraduates and graduate students, she previously taught students at two schools—Benjamin B. Comegys and Penn Alexander—and has partnered with Philadelphia Futures, an area nonprofit focused on prepping low-income, first-generation students for college. During the fall 2018 semester, Penn Philosophy’s presence in Philly classrooms will expand: Graduate students will continue to mentor middle schoolers at Comegys, and Detlefsen, with a team of undergrads, will work with fifth and sixth graders in a range of schools. Detlefsen will also run a seminar for the district’s literature teachers to offer guidance on integrating philosophy into the educators’ regular curricula. The project is in collaboration with Eli Lesser of the School of Social Policy and Practice and Janine Remillard of the Graduate School of Education, as well as the Netter Center for Community Partnerships. Michael O’Shea, a doctoral student, uses a handheld vacuum to collect road dust samples around Philadelphia. So far, he has amassed 50 samples and analyzed 30. It can also affect the health of those around and interacting with the dust, something that greatly interests Reto Gieré, Professor and Chair of Earth and Environmental Science. Gieré, who works collaboratively with several additional Penn researchers, studies the prevalence of lead in the city. For the dust project, O’Shea has so far collected about 50 samples, using the equivalent of a handheld vacuum during early-morning and other off hours when streets are quiet. Under Gieré’s guidance, he has analyzed a little more than half, with preliminary findings revealing several pollutants in a wide range of concentrations, as well as a wide range of mineral phases. The researchers, who presented this work at an international conference in Bari, Italy this summer, plan to gather more samples in hopes of drawing comparisons between different areas of Philadelphia that feature potentially distinct road dust sources. They will investigate many factors, including demographics in relation to road dust composition. There’s a philosophy in criminology called the broken windows theory, which posits that shattered windows or other visible signs of outward disorder can trigger crime. The idea extends to abandoned lots, which early research from Susan Wachter, Albert Sussman Professor of Real Estate and Finance, showed can hurt property values of places nearby simply by proximity. Wachter also found that greening these lots reversed the problem, an idea that John MacDonald, Professor of Criminology and Sociology, wanted to test from the crime perspective. Continuing a long-standing partnership with the Philadelphia Horticultural Society, he teamed up with Eugenia South, Assistant Professor of Emergency Medicine at the Perelman School of Medicine, to research whether fixing up these spaces could decrease crime and improve health. John MacDonald, Professor of Criminology and Sociology, and Eugenia South, Assistant Professor of Emergency Medicine at the Perelman School of Medicine, collaborated on a prior study on environmental stressors and their impact on crime. MacDonald and his collaborators undertook a clustered randomized trial of 541 lots—some of which received a complete makeover, others which received a partial makeover or nothing at all. They found that those with the full intervention experienced a 29 percent drop in gun violence, a 22 percent decrease in burglaries and a 30 percent drop in nuisances like noise complaints and illegal dumping. Residents nearby also reported feeling safer, with fewer mental-health challenges and depression. Through a partnership with a local organization called Casa Monarca and funded by the Penn Center for AIDS Research and a National Institutes of Health grant, work from Emilio Parrado, Dorothy Swaine Thomas Professor of Sociology and Department Chair, and Chenoa Flippen, Associate Professor of Sociology, aims to understand the health risks and needs of Latino immigrants in South Philadelphia, many of whom likely chose the area for its proximity to jobs in Center City. The researchers conducted 300 interviews of 18- to 45-year-olds, asking questions not only about health, but also family dynamics, police interactions, and work experience. The answers were revealing. For example, 43 percent of men and 80 percent of women said they had been tested for HIV. A third had been the victim of a crime. Half reported that at some point they had needed to see a doctor but didn’t, primarily because of real or imagined costs. Though the preliminary data collection has finished, the researchers are still analyzing what they’ve gathered. One of the inaugural Making a Difference in Diverse Communities grants from Penn Arts and Sciences aims to change the diabetes narrative for two minority groups. One population is in Guatemala, where Frances Barg and Kent Bream, both of the Perelman School of Medicine, lead the research. The other lives in the neighborhood served by the Dr. Bernett L. Johnson, Jr. Sayre Health Center at 58th and Walnut Streets, where Bream, a family physician, is the Medical Director. 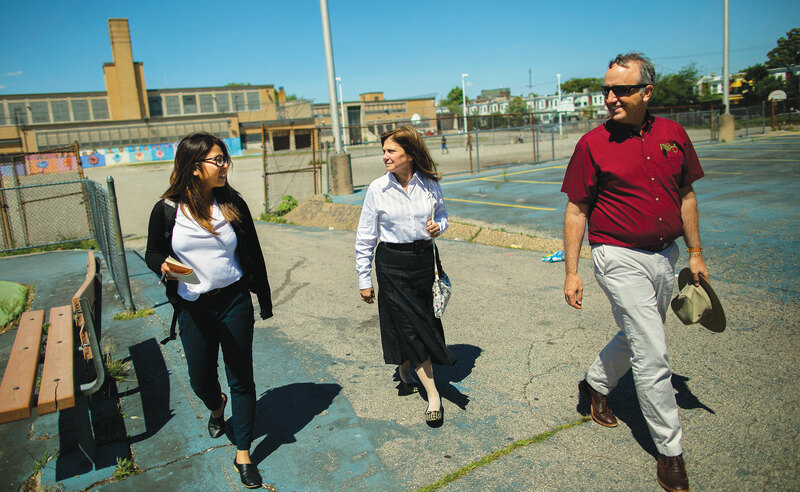 For both sites, Adriana Petryna, Edmund J. and Louise W. Kahn Term Professor in Anthropology, studies the health costs of unhealthy environments and guides students on the ethics of research. Lynn Hur, C'19; Frances Barg, Professor of Family Medicine and Community Health at the Perelman School of Medicine and an associated faculty member in the Department of Anthropology; and Kent Bream, Assistant Professor of Clinical Family Medicine and Community Health. The researchers are combatting a challenge the World Health Organization recently described as one of the biggest global health crises of the 21st century. Today, about 8.5 percent of the adult population worldwide, or 422 million people, have diabetes. Such an approach—considering, for example, politics and economics in health care decisions—contextualizes the disease differently than straightforward scientific inquiry likely would, providing a unique vantage point for the 10 Penn undergraduates who participated this past year. Some traveled to Guatemala to work with patients; others stayed closer to home, doing their part in West Philadelphia. Earth and Environmental Science Department Chair Reto Gieré explains how 40 years after the worst nuclear accident in the U.S., a global energy dilemma endures.